Fast Casual looks like the cursive handwriting of a smart and creative individual who takes pride in their writing, but they also include many quirky touches to show their personality. 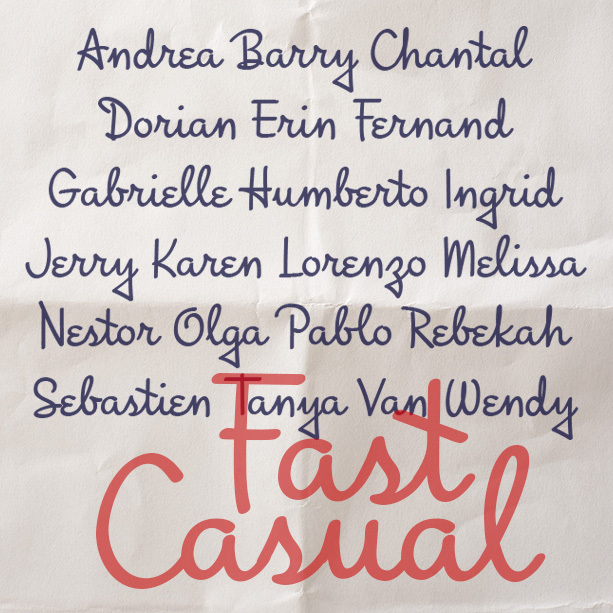 Fast Casual was inspired by the hand-lettered titles of the trailer of the classic 1940 Bette Davis film “The Letter”. I’ve kept many of the quirks—the triangular descenders, the epsilon e’s, the diagonal crossbars—while modernizing and harmonizing it altogether. Harmonium is a beautiful and unusual pair of fonts. With the flare of cursive, Harmonium adds exotic elegance in a narrow format. 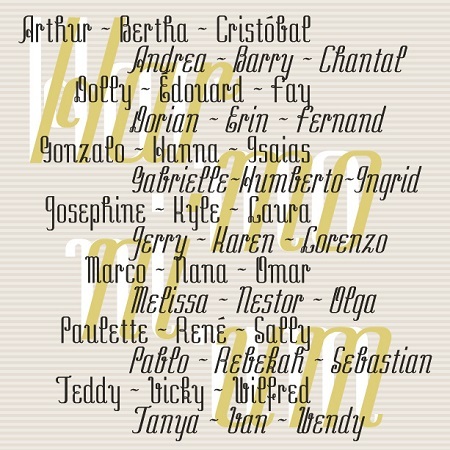 It was inspired by an entry in a 1954 lettering guide. The original design, in only the very sloped style, was recommended for “modern advertising.” I also created a Regular (roman) style for more versatility. 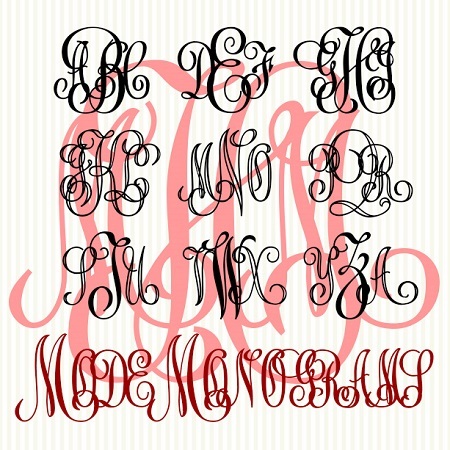 Mode Monograms is a set of 4 fonts to create custom monograms of any number of letters in an extra fancy, cursive style. Inspired by examples from the early 20th century (image), can also be used to set a word or two, with spaces between the letters. 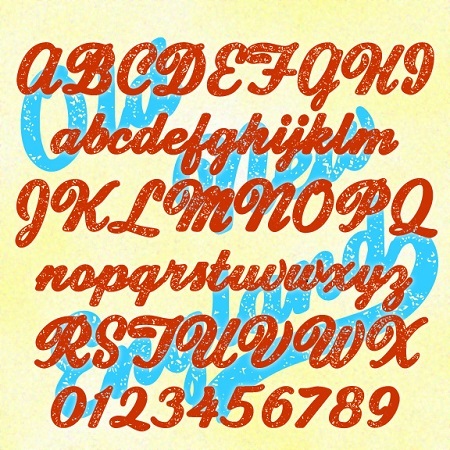 The set includes Solid and Outline fonts, plus 2 Mixes with combinations of both for your convenience. Old New England is a bold and stylish script font with a speckled texture reminiscent of a well-worn T-shirt or salvaged sign, comfortably worn. It’s a companion to New England, the lighter and smoother original. 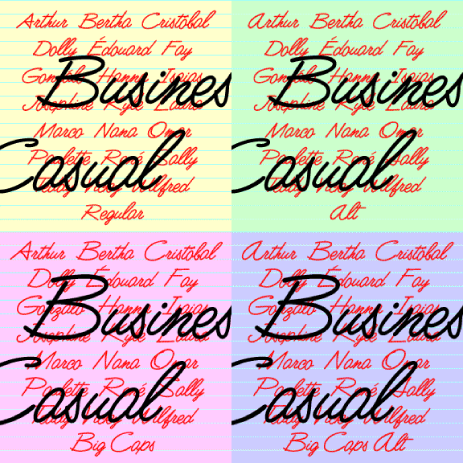 Business Casual is a lively, legible script font that can be both professional and informal. It was inspired by the “lost” analog font Delight (or Delite), produced by Formatt in the 1970s. I’ve kept the basic letterforms, but went for a more uniform stroke with rounded ends, like a felt-tip. The set includes Big Caps and Alternate variations, more closely resembling the original forms but somewhat less contemporary in feel. 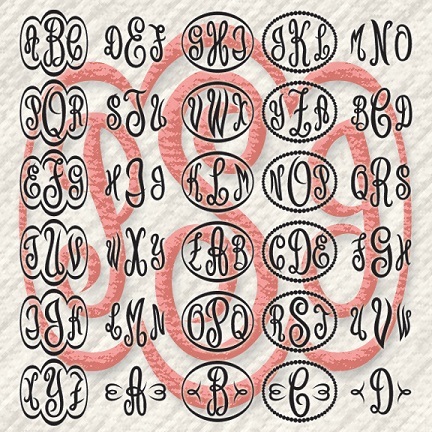 VINE MONOGRAMS® are my most intricate and interwined monograms yet! The design was inspired by letters made for machine “pantograph” engraving (see brass A at left.) I’ve completely redrawn each letter and developed a series of 6 related fonts that can be used to create original 3-letter monograms with or without decorative frames. These fonts lets you easily type 1-, 2-, and 3-letter script monograms–with and without a variety of decorative frames–in most any program. 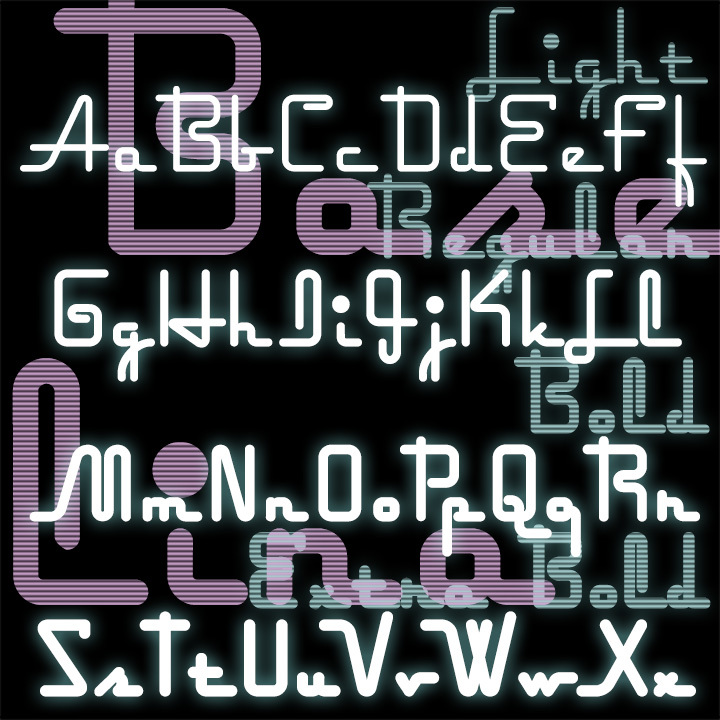 Each font includes all 26 letters in all three positions, plus & in the middle.